The belief in a being conceived as the perfect ruler and creator of the universe hasdefined culture, politics and the ethos of humanity since prehistoric times.The effect of religious beliefs are found in the headlines of today's news. 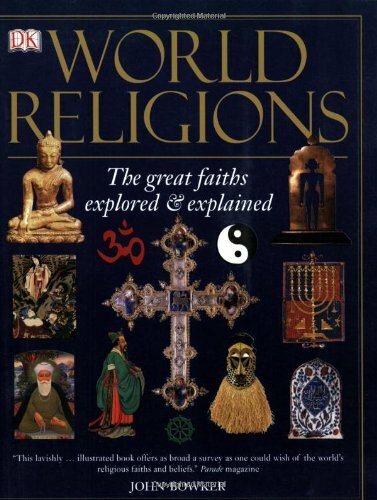 Yet as powerful as religion is most of humankind live in ignorance about other's religious beliefs.This guide can help readers to be better informed about the seven major religions of the world. I used the book prior to my visit to Buddhistic Thailand.I was in need of a fast refresher course on Buddhism as my college course, "Comparative Religions", taken in the early seventies, had seriously faded. The information in this book is rudimentary, and though the information stimulated dormant brain cells there was no new insights added.The photos and maps (showing the world influence of each religion) are superb.The writing is clear and easy to understand (most teenagers would easily grasp the concepts).Each chapter lays out information about the basic dogma of each religion, and deals with such issues as the role of women, afterlife (exception being Judaism), holidays and important sacred text.Yet, this guide would have had been more informative if it included charts and gave the readers contemporary illustrations of each faith (ie sidebars that give biographic sketches of today's `leaders and shakers' in each faith).In short it could have been better. 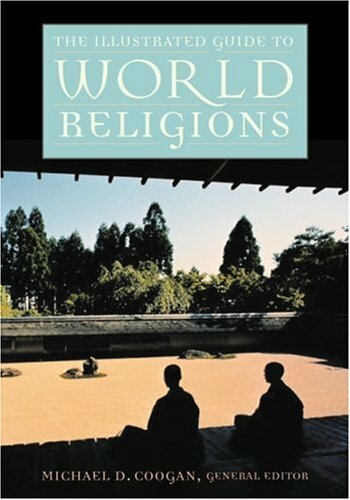 For those that have a comprehension of the major world religions Michael Coogan's book will not add much to your knowledge.For those little to no comprehesion and are in search of a quick, terse introduction into the seven major world religions (Jr. High/High School especially) this guide is recommended. 3.5 starsA side note I found Karen Armstrong's short book "Buddha" to be an excellent read. 3. 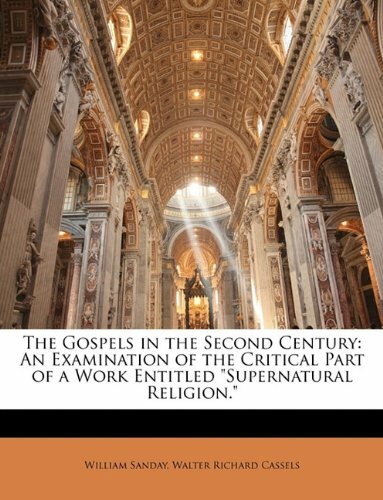 The Gospels in the Second Century: An Examination of the Critical Part of a Work Entitled "Supernatural Religion." In this, companion volume to his worldwide bestseller, Care of the Soul, Thomas Moore offers a way of living in this new and confusing century. Drawing on faiths front all over tile world, as well as from his own vast well of knowledge and personal experience, Moore shows its ]low religion can be used to embrace others, rather than exclude them. He helps its become comfortable with our doubts, and reveals a, liberating truth -- it is in the dark corners of the soul Chat trite faith is born. Intimate and provocative, Moore writes with the compassion of a parent and the wisdom of a trite teacher. Spirituality should never be used as an escape route, according to Thomas Moore's Soul's Religion. Rather, it should be the catalyst that helps us face our everyday failures, angst, and emotional entanglements. This has always been Moore's anthem: that spirituality rests in the depths of experience, in the ordeals and challenges that initiate us into a stronger sense of life's meaning. "This book may look simple, but it is not naive," promises Moore, who seesSoul's Religion as a companion volume to the bestselling Care of theSoul. It doesn't coddle the ego. It offers challenge to the person fully in the flesh while developing at the same time an intelligent and deep-seated spiritual identity.... In this spirituality justice is more important than enlightenment and humor holier than ambition. I find peace and rest when I read Thomas Moore. I find myself picking up THE SOUL'S RELIGION over and over again. I look to Amazon frequently for Thomas Moore's books because Amazon always has them. 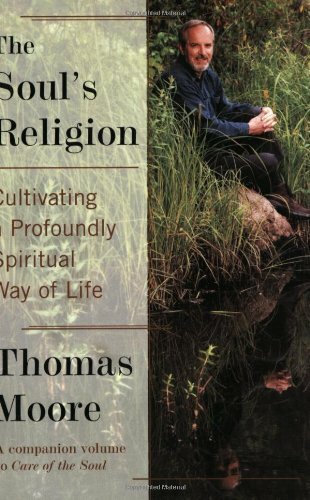 I just finished re-reading this wise and encouraging account of Moore's personal evolution and found it to be very appealing.It has the feel of an apologia (in the sense of Coleridge's brief poem), without the anxious defensiveness often associated with that term.Moore sets out here to "link soul and spirit," his apt image for the religious calling. "To believe," he writes (page 26), "is to be attentive to that seed that is part of our makeup.It will grow us into what we are called to be." Moore imagines belief as a kind of"profound cultivation" which, when practiced by individuals, within or beyond the religions, can help those seeds drive roots deep into the soul. Read this book... and grow well! I have not received this item and need you to research the reason. I am an ordained minister and a chaplain. This is my new favorite book. As Thomas Moore writes, each of us can only be the self we already truly are. I especially appreciate the personal experiences the author includes. His openness models the deep self-acceptance he advocates for all of us. There is an honest acceptance of the realities and sometimes pain that Life holds, and healthier approach to those dark periods from which we can learn and deepen. Thomas Moore's writing style is gentle and deeply genuine. I have enjoyed other books he has written, but this is, I believe, his Great Work. 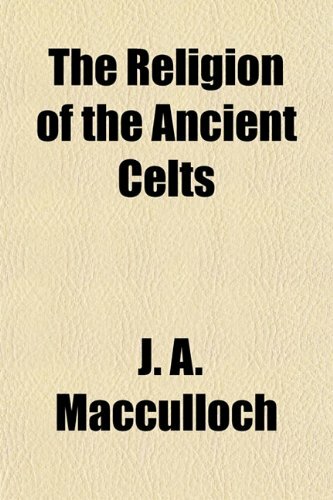 Originally published in 1911 MacCulloch uses various texts as a source to piece this tome on the religion of the pre-Christian Celts together. Overall a good work, especially when you consider this was written before most, if not all, of the major archaeological finds that gave great insight into the ancient Celts. I love reading historical books that were published in the 1800's and early 1900's because the authors are not chained by political correctness and were often willing to think outside the box instead of toeing the line of mainstream academia. Some of his translations are... Odd. This book makes me wonder about early scholarship, and how much we should rely on it as we delve deeper into archeology and our understanding becomes clearer. Originally published in 1911, and now available in Dover paperback, "Religion of the Ancient Celts," is a well written and engaging scholarly work. Well worth its price, the work is suitable to the general public, while still valuable to those interested in the Celts from an historic, linguistic, mythological or ethnological standpoint.MacCulloch covers his subject matter clearly and thoroughly (referencing such things as parallels with Greek mythology and Sumerian religion) and writes in a style that will satisfy the expert without mystifying or losing the attention of the amateur. Although the book may be "dated", it is not "outdated".Given the scholarly standards of its time, this may be more of a virtue than a drawback.More recent results in the area are naturally not addressed.But the work is consistent with comparative methods, and considers the consensus without neglecting competing accounts.There is neither neo-Druidic nonsense nor needless pedantry.While the study is generally limited to the culture of the British Isles, as opposed to that of the Continent, this is due to the lack of Continental oral tradition rather than to lack of attention on the author's part. MacCulloch is judicious. Yet he addresses issues such as the pre-Indo-European origins of the Mother-Goddess cult of Brigid, as the legends of the faerie-folk known as the "Side,"* (as in banshee) and as the stories of "Isles to the West" now sunk below the sea. Fans of J.R.R. Tolkien will find this work enthralling and familiar, as it shows some of the sources for his magnificent "Middle-Earth. "Avid youngsters, Celtophiles, students of Irish poet W.B. Yeats, followers of Marija Gimbutas (Civilization of the Goddess) and admirers of Robert Graves (The White Goddess) will likewise be pleased. I can recommend this work unreservedly for readers of all persuasions. Want to know more about the faiths of Judaism, Christianity, and Islam? 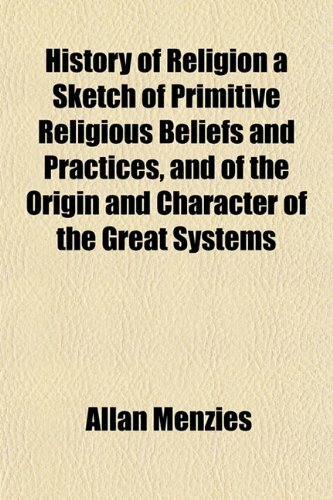 This plain-English guide traces their evolution from their commonorigin - Abraham - and explains their different, yet linked, beliefs.You'll see how each religion developed, endured setbacks, and became a fixture in modern society - and you'll learn how members havedeveloped similar approaches to worship. I bought this book to compare my own faith with that of other religion, so that I can understand the differences. When I received the book, with enthusiasm I spot-checked the book with regards to major points in my faith (Roman Catholic) as compared to others. Unfortunately, I found that the book illustrated a significant ignorance of what MY faith teaches, and a distinct bias against some of the Church's teaching. For instance, re heaven and hell, the book states "Today, Roman Catholics are the only major Christian sect to believe that everyone goes to purgatory before being raised to heaven or dropped to hell." - which is pure hogwash! In addition, one of the MOST IMPORTANT tenets of the Catholic faith is the believe in the TRUE PRESENCE of Christ in the Eucharist, let the book deals with it as "At one time the Christian world was hotly divided over the question..........While the debate has faded, some Christian faiths (***MY WORDS - Roman Catholics, the largest group of the Christian faith in the world***) still believe in transubstantiation". This is not a balanced statement and suggest bias. Finally, I checked out Medjugorje (major shrines), and found that brief summary full of error. There are other errors which I won't touch on due to space limitations. 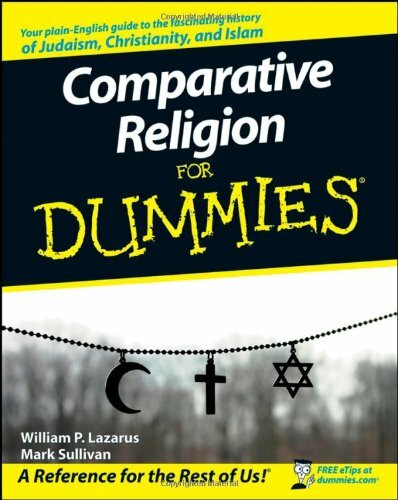 SO, re this book in it's first half hour - how can it show me differences between my religion and others when it is ignorant or biased at least in some areas of my own religion. Re the other religions, are there major errors or bias in treating their beliefs??? This book is of no value to me, since I can't trust it. This is a great introduction to the history of the three Abrahamic religions: Judaism, Christianity, and Islam.It covers the origins of each religion, as well as the basic tenets and sacred texts of each.As in the other "Dummies" books, the text is easy to follow and very readable (though I would disagree with the reviewer who stated it was "for little kids"). 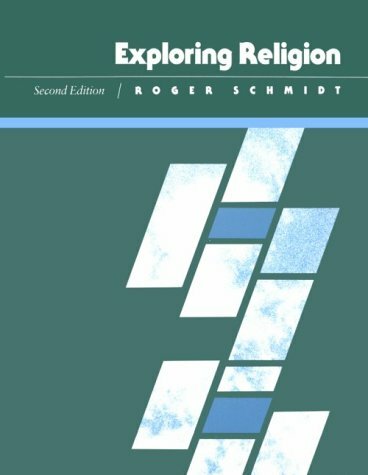 This book is written from a historical perspective by religious scholars, and is fairly even-handed (it doesn't support one of these religions over the others), which I appreciated.I would recommend this book to anyone looking for a simple place to start in learning about the Abrahamic religions and increasing their level of religious literacy. I've read perhaps a dozen books on these three religions, and this is the worst. This is perhaps the most dumbed-down book I've ever read. It's actually insulting how little information is conveyed in the chapter and a half I read of it. But the book is not for you if you believe in God; the authors' first point is that God is a make-believe concept, cooked up by ignorant ancients. The authors also downplay the importance of salvation and grace in Christianity--and if I'm not mistaken, those are two rather important points in that religion. Interesting butnot entirely accurate. Said Paul started the Christian Church and that Paul never met Jesus.What about the road to Damascus? What about Jesus saying "On this rock I build the church"? Good summary of various religions. After having read this book, I have to say that I wasn't terribly impressed--nor was I seriously let down. There are plenty of great pieces of hard to find information about Irish Druids--I mean, lets face it. These days you have to really look hard to find your way out of all the wishy-washy fairy-tales concerning Druids and Celtic religion--especially on the internet, where almost everyone seems to be in costume. I also appriciated the mention of other Celtic tribes throughout Europe. What I didn't care for was the repeated and tiresome disdain towards the "so-called Druids" of Britain. When I'm reading for information/enlightenment, it's difficult to feel that I'm getting it from a credible source when the author's writing seems so biased and disdainful towards the non-Irish Druids. 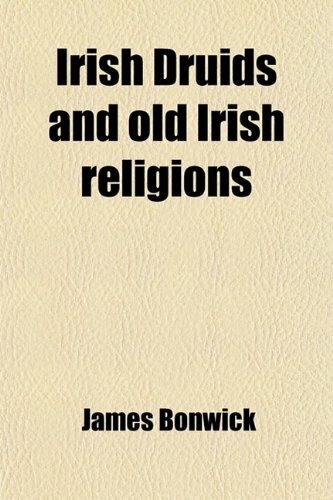 Yes, I know that the book is written with Ireland in mind, but the author just seemed to keep making digs at the other country while elevating Irish Druids over the rest. Kind of annoying, but not terrible. Contrary to the other "reviewer", this is a classic reprinted annually with the originals worth as much as a nice flat screen for a reason. The book has always stirred controversy because it doesn't kow tow to the "correct view" of those who want to believe that everything before Christianity was barbarism. At the time it was originally published in 1894, this book was literally revolutionary.Keep in mind, the belief of the time was that the Irish were less than human and this book showed that they had been civilized with laws, music, history, and science long before the forced conversion which included the murdering of almost all of the Druid priests.Check out Wikipedia and other sources for more information on James Bonwick (who was very much a religous Christian btw) and the Druids.And, read it for yourself - it is an easy read if you relax about things like the Scottish being called the Scotch and just go with the flow of the book. 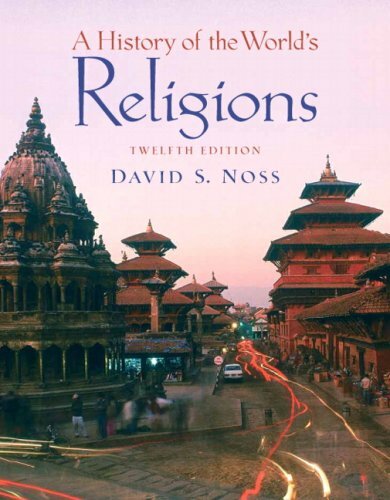 This is a great book to invest in when wanting to explore religion into great depth.I had to buy this book for an online college course and really found myself enjoying the history and ways of explanation as to what religion really is.Religion is very complicated to oversee due to the many different religions that are and have been in practice.I found that this book really hit all of the key points and important factors to what religion is and where it came from.Although religion can be viewed differently even from those practicing the same religion, Roger Schmidt, the author, included the many different perspectives and elaborated a tremendous amount on each.It is interesting to know the history of religion while also exploring all the different viewpoints.This book seems to put everything into perspective in order to form or reform your very own viewpoint as well.In reading this book, I found myself very intrigued to learn all of the information that I could in order to take a different look behind what I knew so little about.I recommend this book to anyone that is eager to learn more on religion or about religion at all.It is very interesting to look at so many different views in so much depth, and it really changed the way I think about religion as a whole. It seems that Christian theologians have attempted to find the continuity of the faith with it's ancient Jewish roots since the beginning. This has overflowed into the extremes such as Marcion and others who found little or no continuity and another extreme that attempts to liberalize and distill Christianity and Judaism to their lowest common denominators to the point of them losing their significance altogether. As with his work, Jesus of Nazareth, Pope Benedict XVI once again draws us back to the essentials of our faith in order to provide an honest comparison. He finds the essential link of Old/New Testament and Judaism/Christianity lies in God's revealing himself to man by way of covenant. Therein is the key to understanding the continuity of the two faiths and the common ground for dialog and understanding. The identification of covenant makes the Foreword by Dr. Scott Hahn, who lectures and writes extensively on covenant theology, all the more appropriate. A well reasoned, concise, and helpful discussion leading to a deeper understanding of the continuity of faith in Christianity from Judaism. A must have for any Christian or Jewish theologian's library. Cardinal Ratzinger is now Pope Benedict XVI.At the time of this writing he was Prefect of the Vatican Congregation for the Propogation of the Faith. This small book is his exploration of ressourcement involvingbut not limited to a very broad sketching of biblical theology, involving "not just a recovery of the Fathers, but a return to the place where the Fathers returned, again and again: the living oracles, the Word of God" (15). 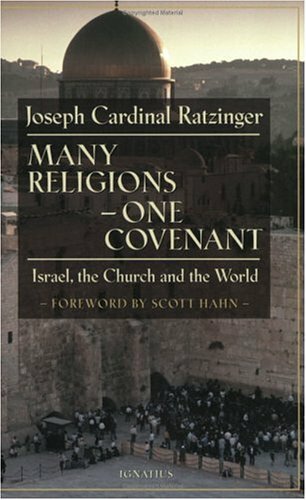 In Part One, "Israel, the Church and the World," Ratzinger considers whether a rapprochement between the Church and Israel is possible after Auschwitz, and if so toward what end.He begins by examining how the Catechism of the Catholic Church (1992)highlights the role of Jesus in uniting Jew and Gentile in the worship of the true and Living God.Through His coming, Jesus "brings together the histories of the nations in the community of the the history of Abraham the history of Israel.His mission is unification, reconciliation, as the Letter to the Ephesians (2:18-22) will then present it. The history of Israel should become the history of all" (27).Focusing on how the history and status of the Jews as the chosen people is foundational to the identity and reality of the Church, he establishes the continuing importance of Israel for the Church.The key theme of Jesus' coming is reconciliation, not only of Jew and Gentile to God, but of Jew and Gentile to one another. Besides reconciliation, Ratzinger explores continuity in the realm of Torah, highlighting the catechism's avowal that Jesus came not to abolish but to fulfill (and thus, validate) the Law.There must also be a continuity between Jesus and Israel, or he is an agent of division rather than reconciliation.Ratzinger tends to collapse the Law into the moral law, and sees Jesus as elevating that moral Law to its highest plane and deepest focus, thus validating rather than replacing it.He sees the Older Testmant as fundamentally Law and Promise, and Christ as the interpreter of the former and the fulfillment of the latter. In Part Two, "The New Covenant," he explores whether the older andNew Covenants are each a vassal covenant or a grant covenant, andcollapses the covenants plural and lower case into the one Covenant singular and upper case, failing to adequately explain the rationale for and the nature of this shift.I find his theologizing too abstract and self-consciously christocentric, as if all of God's doings collapse into the work of Christ.Part Three is a Homily, "The New Manna," exploring the paradoxical nature of our relationship with God and of His work in the world, forswearing force, accepting weakness and vulnerability, yet inexorably transforming everything. Part Four, "The Dialogue of The Religions and the Relationship Between Judaism and Christianity," is the most crucial chapter for my work.It involves a bare and careful sketch of a kind of logos theology,in which the truths we know of God are always partial, and the revelation we receive is often a journey in the dark, yet toward the light. The chapter includes a sletch of the birth and nature of ecumenism, and how Christendom discovered and began to honor the religious imprinting of peoples whom it simply viewed as a target audience.He views discussions of unity and diversity to be crucial, since the geopolitical realities we all live with require of us progress in peace, justice, and preservation of the earth. He broadly divides world religions into two categories:tribal and universal, and then divides universal religions into theistic ones (Judaism, Christianity, Islam) and mystical ones.He opens the question as to whether unity is to be attained either by mystical religions absorbing the theistic ones, or vice versa.To these two options he adds a third, the pragmatic solution, orthoprzxy, by which any religion would be evaluated and disciplined through its practice of the Golden Rule. He identifies four problems, or four losses, if mystical religion were to absorb theistic religion:loss of a distinction between theistic and mystical religions, loss of the cosmos through all embracing interiority, loss of the relevance and meaning of history, and loss of binding ethics.As for the pragmatic model (orthopraxy) he indicates that religion must inform and structure ethics and morality which are not free-floating self evident categories, and that the goal is not religion as moralism but rather growth in the knowledge and service of God. As for theistic religion absorbing the mystical, he first considers the unique relationship between Judaism and Christianity, and the question for their peaceful reconciliation (he would probably view coexistence as inadequate).He identifies two key ideas to reduce the tension and increase agreement between the Church and Israel:that through Jesus Israel's God becomes the God of the nations, and that Jesus is the servant of Israel's God for the nations' sake.These two facts can be freely acknowledged by both Jews and Christians.He suggests that two poles anchor the faith of Israel:Torah and the Messianic hope. He sees Christianity as similarly anchored, with Jesus as the Church's Sinai, and the second coming as her messianic hope. These two poles--Torah and hope link past, present and future for Israel as obedience to a received deposit, present living out of God's will, and hope in the Messiah to come.The same is true for the Church, living in the obedience of faith (past/faith), anticipation of the parousia (future/hope), and love in the present.Ratzinger avers that Christ therefore both separates and unites the Church and Israel. Finally, in configuring the relationship between the Christian faith and mystical religions, Ratzinger says Christianity has room for a God who s always greater than our formulations, and that God's self-revelation simultaneously conceals, as in the kenosis (the self-emptying of Christ in the Incarnation).In structuring and conceiving the dialogue or religions, he says (1) the encounter of thr religions is not possible by renouncing or downplaying truth but only by encountering truth more deeply; (2)We must be prepared to acknowledge and find the truth others have found even when it comes to us in strange and foreign garb; (3) Mission and dialogue go hand in hand, since dialogue aims at finding truth and missionaries must always be learners as well as teachers.Returning to his logos imagery, he closes by indicating that all of us have encountered truth to some degree and we must learn from each other, listening to the Logos. Clearly, Ratzinger is a first-class thinker. That the book is so brief is both a strength and weakness, as matters are repeatedly sketched instead of drawn.One wants to know more, and yet, appreciates the momentum of the overview.I appreciate the book as a summation of now Pope Benedict XVI's perspective, and have three problems with the treatment.First, I find myself alienated and unconvinced by overly abstract theological arguments:it seems a linguistic game to me (cf. Wittgenstein).Second,to the degree he seeks to speak for Israel, as in the case of what Jews believe, he offends.He would not welcome a Jews defining and characterizing the Holy See. The editors should have had a rabbi on hand to Jewishly validate or invalidate the portrait of the Jewish people Ratzinger constructs. Finally, I find myself far less sanguine about the prospects of absorbing or reaching rapprochement with the world religions.My evangelical conditioning suggests that the voices heard in some religions come from a different kingdom. Despite these caveats, this is an important book for those seeking an orientation to the current pope's mindset and views on the Jews. This is a surprising book! I was amazed to read of such views taken by the Holy Pontiff. I have a more positive view after reading this short but important book. Much of what Cardinal Ratzinger has said here has been said in other works (by him or by others).However, the given text functions as a thoughtful synthesis of these movements of thought.It is not an attempt to completely answer the question of pluralism or of the Christian-Jewish relationship.Instead, this text lays a basic framework for considering Christ's role in fulfilling the Jewish faith, the nature of Covenant as God's self-communication, the nature of the New Covenant, and religious dialogue. I suggest this text to all but not lightly.While it is not very esoteric, it is weighty enough to require quiet reflection.The fruits of reading it are great and also give one a starting point for further thought on the subject material.I suggest it to all open minds. How do religion and the natural world interact with one another? Grounding Religion introduces students to the growing field of religion and ecology, exploring a series of questions about how the religious world influences and is influenced by ecological systems. 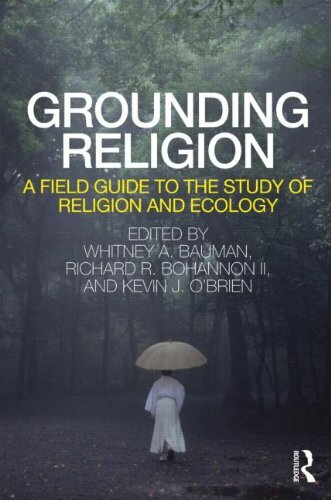 Grounding Religion examines the central concepts of ‘religion’ and ‘ecology’ using analysis, dialogical exchanges by established scholars in the field, and case studies. 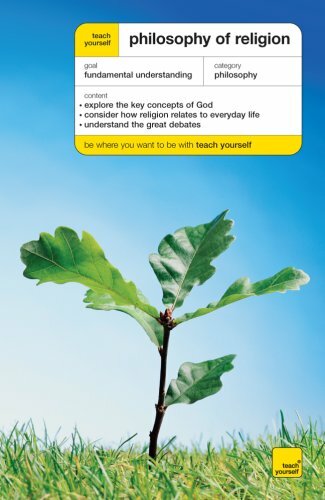 The first textbook to encourage critical thinking about the relationships between the environment and religious beliefs and practices, it also provides an expansive overview of the academic field of religion and ecology as it has emerged in the past forty years. The contributors introduce students to new ways of thinking about environmental degradation and the responses of religious people. Each chapter brings a new perspective on key concepts such as sustainability, animals, gender, economics, environmental justice, globalization and place. Discussion questions and contemporary case studies focusing on topics such as Muslim farmers in the US and Appalachian environmental struggles help students apply the perspective to current events, other media, and their own interests. This first-ever survey of spiritual beliefs and practices among managers and executives finds that, while most people have strong spiritual beliefs, few feel that they can act on those beliefs at work. And yet, overall company performance is actually higher in companies where company values and spiritual values coalesce. Filling a gap in today's literature on spirituality and business, this book examines five proven models for introducing spirituality to the workplace and spells out the strengths and weaknesses of each model. More than a personal guide to spiritual well-being, it shows how you can harness the immense spiritual energy at everyone's core, and outlines solutions for bringing that energy into the organization. "A Spiritual Audit of Corporate America" is a book that should be read by all members of the corporate world (not only in the US), who want to learn more about the various models in existence about workplace spirituality. I have used this book as a foundation for my doctoral dissertation on workplace spirituality. "A Spiritual Audit" has also been an important foundation for the book that resulted from this dissertation process and the additional research I executed on the topic. The book I am referring to is titled, "Spirituality in the Workplace: What it is; Why it Matters; How to Make it Work for You" (co-authored with Dr. Satinder Dhiman and Dr. Richard King). 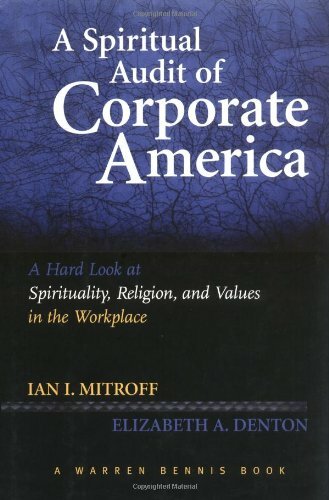 I can admit without reservation that Ian Mitroff's work has been very important in our perspectives toward workplace spirituality, and that it has served as an encouragement in the fact that spirituality and religion are two entirely different phenomena. This book is the result of research conducted by the authors across various profit and non-profit organizations in the U.S. The book does contribute to the body of research considering spirituality in the workplace. The field is still young from an academic perspective and apparently hung-up on the operational definition of spirituality. This research helps the prospective researcher narrow down the constructs of spirituality. It also demonstrates empirically that there is a difference between religion and spirituality and how well the two are received in the workplace. The authors also describe a range of organizations, in the form of models, that describe the various ways spirituality is indoctrinated into organizations, moving from one extreme to the other. This book is also good for the layman in that it is not bogged down in academic wording.It also provides insights on how an organization can implement the idea of the "whole person" in the workplace. Ian I. Mitroff and Elizabeth Denton proffer that many of the problems faced by business and society are the result of a spiritual impoverishment that they discovered in their research on organizations. The authors bring an authoritative, scholarly tone to their material, yet they write conversationally and make no effort to hide their opinions. While indicting corporate America for its neglect of the spiritual, Mitroff and Denton also cite examples of businesses with soul that encourage the expression of spirit. We [...] recommend this book to all readers interested in the creation of a more spiritually fulfilling workplace. This book over-promises based on its title.It offers three things:its company research is based on mailed-back questionnaires from 131 people from companies described only as coming from a "special database" and as being located on the east coast and the west coast; in addition, the authors conducted a number of interviews and "partial" interviews.Many of the "companies" are not-for-profits and consulting firms.The significant problem here is that this cannot be, in any realistic manner, considered to be an audit of corporate America.This is preliminary and exploratory work.There is some interesting writing on spirituality and the differences between spirituality and religion, although the writing suggests (to me) biases on the authors' part.In addition, the book describes companies and organizations that have been much written about elsewhere, such asAA, Tom's of Maine, Ben and Jerry's, the YMCA. The book can be stimulating of your thinking and offer some useful insights, and for that I appreciate it, but it is not a broad based, valid, objective study of spirituality in corporate America. Packed with illustrations, photographs, and maps Asian Religions brings the rich religions of Asia to life. 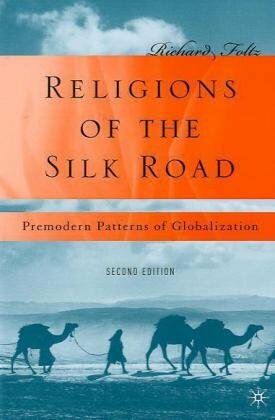 Examines religions of South/Southeast Asia, China, and Northeast Asia. Contains numerous photographs of rituals/practices and historical and geographical maps. Covers Buddhism, Jainism, Kikhism, Confucianism, Daoism, Shinto, Islam, and newer religious movements. Historical approach shows how traditions have changed over time. 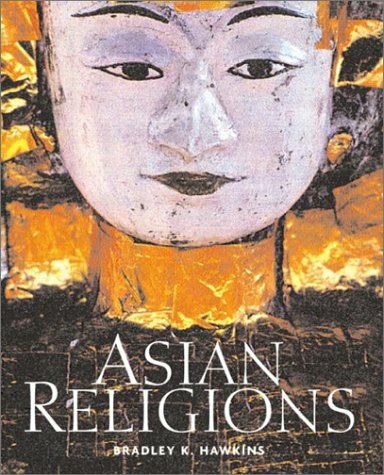 Asian Religions is a passport to the fascinating world of Asian thought. Exploring all the major religions of South and Southeast Asia, China, and Northeast Asia, Bradley K. Hawkins looks at Hinduism, Buddhism, Jainism, Sikhism, Confucianism, Daoism, Shinto, and the new religious movements. Two chapters devoted to Islam shows its significants in Southeast Asia. Numerous full-color photos and art - both historical and contemporary - provide insight into the artistic expressions, sacred architecture, and people of the various traditions. Photographs of contemporary riturals/practices give a "feel" of each tradition as a living religion; Maps provide valuable geographical and historical context. The author shows how the traditions interrelate and places them within a wider global context. Modern expressions of each tradition are examined. Hawkins takes an historical approach that helps the reader better understand each tradition and show how each has developed and changed over time. The book is divided into three geographical areas: South and Southeast Asia (including Vietnam, Sri Lanka and Indonesia); China; and Northeast Asia (including Japan and Korea). Throughout African-American history, religion has been indelibly intertwined with the fight against intolerance and racial prejudice. Martin Luther King, Jr.-America's best-known champion of civil liberties-was a Baptist minister. Father Divine, a fiery preacher who established a large following in the 1920s and 1930s, convinced his disciples that he could cure not only disease and infirmity, but also poverty and racism. An in-depth examination of African-American history and religion, this comprehensive and lively book provides panoramic coverage of the black religious and social experience in America. Renowned historian Albert J. Raboteau traces the subtle blending of African tribal customs with the powerful Christian establishment, the migration to cities, the growth of Islam, and the 200-year fight for freedom and identity which was so often centered around African-American churches. From the African Methodist Episcopal Church to the Nation of Islam and from the first African slaves to Louis Farrakhan, this far-reaching book chronicles the evolution of an important and influential component of our religious and historical heritage. African American Religion combines meticulously researched historical facts with a fast-paced, engaging narrative that will appeal to readers of any age. Albert J. Raboteau is American's foremost expert on the history of African American religion. 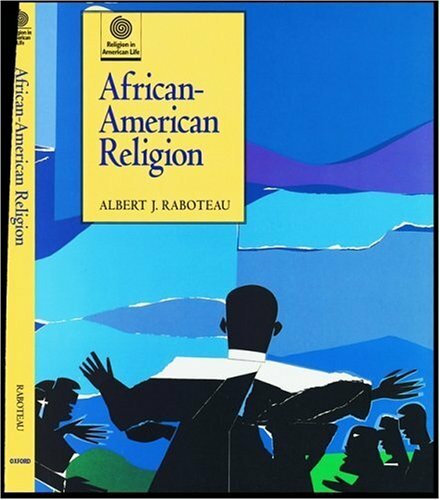 In this text, "African-American Religion," which is part of the larger "Religion in American Life" series, Raboteau offers an engaging panorama of how religion (of all types, not just Christianity) impacted African Americans and how their religion impacted America. This book is supposed to be part of a series of texts that provide a point counterpoint format, parallelling something of a debate on some interesting subject. 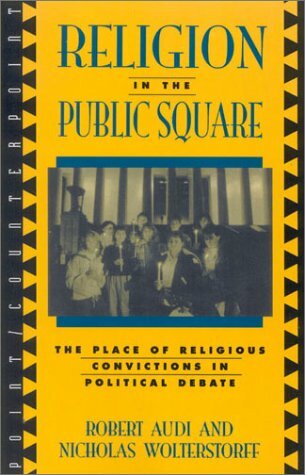 "Religion in the Public Square" is not a debate, however, but two parallel essays with reflective commentaries on each by the opposing author. Ironically, each of the essays describes largely the SAME position (that of the ideal of liberal democracy, which protects religious liberties and the neutrality of the state with respect to religion) but they have only subtle philosophical differences. For example, Wolterstorff thinks that any reasons whatever should be allowed in public discourse so long as they are persuasive to the people hearing them, and Audi thinks that the reasons given should have constituted a significant part of the basis for why the person employing those reasons accepts them himself. Hardly the basis for an interesting discussion, one might say. Unfortunately, neither author writes their essays in an argumentative format nor do they even have the other author in mind when they write their essays. Thus, they often repeat the same concepts using different language and different terminology, which only adds to the confusion of the book. The first author, Robert Audi, presents his arguments with little or no structure in an almost stream of conscience format. Although he ultimately has important arguments lurking about, they get lost amongst his many useless, technical distinctions that he forgets about as soon as he raises them (as if they were important distinctions for their own sake). If the book was a debate, he would be making points and repeating them without telling us why they are important in the larger context of the debate. In his commentary on Wolterstorff, he writes sentences like, "I propose that conscientious citizens have a prima facie obligation to have and be willing to offer at least one secular reason that is evidentially adequate and motivationally sufficient" (123), as if it was obvious why it was important to note that the obligation was "prima facie" or that it was clear for whom these so-called "secular reasons" should be motivational. Moreover, when Audi writes this sentence, his opponent (Wolterstorff) has already criticized the coherence of a "secular reason" as ultimately meaningless, and yet Audi insists on using it in an unqualified and ambiguous way. Such lazy language is simply unacceptable, but unavoidable in the a book of this scope. For unfamiliar readers, Audi's complete text on this subject "Religious Commitment and Secular Reason" will be indispensable for understanding his ideas. Wolterstorff by contrast provides a more clear although less convincing argument for allowing religious language in the public square. Although his arguments are subtle, profoundly post modern, and surprisingly anti-foundationalist, much of his analysis is unfortunately over-theoretical and uninteresting from a practical standpoint. His criticisms of the "independent source" of Rawls and Locke may interest professors of jurisprudence, but not an undergraduate with a merely passing interest on the subject. In the end, neither author more than glosses on any of the interesting subjects that should have been the focus of this debate such as abortion or school prayer (this book was written before stem cell research was an issue). The whole discussion stays at the level of vague abstractions and hypothetical political theories, never so much as touching on the real problems with religious reasoning in the public square (such as the Catholic Church's perpetuation of AIDS in Sub-Saharan Africa through its condemnation of condom use in that region, or religious arguments against homosexual marriage). Finally, it is sadly not obvious that either author is aware of any religion besides Christianity or (in passing) Judaism. Ironically, Audi, who was apparently blind to the fact that no religion besides Christianity or Judaism has been mentioned, writes of Wolterstorff's essay that it is "sensitive to a variety of religious perspectives" (121). The book gets one star for being unintentionally humorous. This book is appropriate for an upper level philosophy seminar in the major, and will also be of interest to graduate students in political science and law.The debate between Audi and Wolterstorff is not reallyabout the entire multifaceted topic of the "separation of church andstate" in the United States (a lot of which concerns the scope offreedom of religious practice and strict limitations on public funding ofreligious causes).The debate is actually about a much more focused topiccentral to democratic theory: in a nation governed by a legitimatedemocratic process of law and policy formation through open debate andvoting, what sort of considerations is it morally legitimate for citizensinvoke in deciding what laws and policies to support, and appealing toothers to share their views? (Thus the question is about moral norms ofcitizenship, not legal norms governing actual democratic processes).InRawlsian lingo, this is a question about the content of "publicreason. "Audi believes citizens in a democracy ought not invokereligious beliefs, whereas Wolterstorff thinks such beliefs are on the sameepistemic footing as all other considerations on which citizens must drawin making rational judgments about the common good of their society.Otherauthors who have contributed to this debate include Michael Perry, JohnRawls, Phillip Quinn, and the authors featured in Paul Weithman'scollection.The biggest drawback of all this literature, including thisbook, is that the interlocutors on both sides are unfamiliar with thegrowing body of work on the deliberative theory of democracy coming out ofthe republican tradition in jurisprudence and out of discourse ethics incontinental philosophy.So they to not address the implications ofdeliberative models of democracy for the issue of appeal to religiousconvictions in political action. AOID THIS BOOK IF YOU CAN! Hassle-free transaction at a great price. The book was neatly wrapped for protection, thank you for that.I hope to do business with you again! I use the Cambridge Illustrated History of Religions in a course I teach on World Religions for my university -- it has a good breadth of coverage, good detail, wonderful photography, and a very nice colour layout that makes for easier reading. Editor John Bowker provides an introduction and conclusion as well as one of the topical sections. 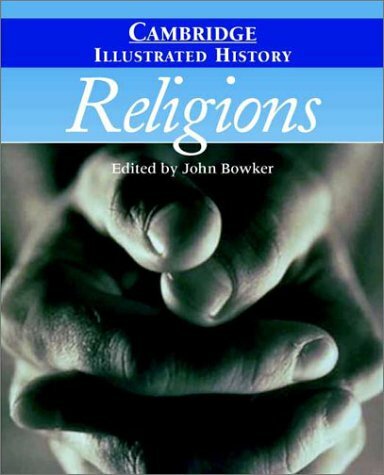 In the introduction, Bowker writes, 'There is no known society in which religion has not played a part, and frequently a controlling and creative part. This seems to have been true of the earliest societies, but in their case the history of religions is not easy to write.' Bowker traces the reconstruction and speculation of prehistoric societies, with illustrations of cave paintings, totem poles, Mayan pyramid structures, Native American costumes, and maps of South America and Oceania to help illustrate the diversity of ways beyond the printed word that different peoples have kept alive the religious traditions handed down to them. 'The attempt to write history according to laws governing human behaviour had an immensely important influence during much of the twentieth century, because it created those disciplines which called themselves "the social science".' This is not, however, the only possible way to explore religion, and Bowker and his fellow authors do stretch their reporting and analysis beyond this framework. Some tap into the common core of ideas that seems to permeate the different religions, and some do anthropological studies that look for echoes of the present in the past. This book is useful both as a reference and as a narrative history, designed for reading. 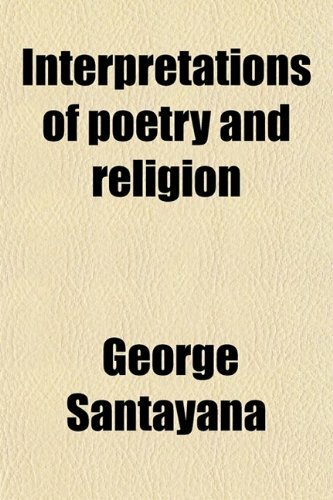 The religions are described both in terms of beliefs and in terms of practices, with side-bar commentary that helps to elucidate key points throughout the text. There are also occasional essays, spread across one or two pages, that might highlight in more detail some of the scriptures, cultural issues, historical events, or other key pieces that lend understanding to the religion. For example, in the section on Buddhism, there are special essays on the Buddha's First Sermon, Women in Japanese Buddhism, and Chinese Suppression; in the section on Islam, there are special essays on The Quran, Islam in Pakistan, and Mosques. The concluding section, on new religions, discusses various practices and communities that still hearken back to older traditions. Pagans, for example, tend to dismiss use of the term neo-Pagan, as they maintain that their religion taps into ancient ideas rather than exists as a new creation. Similarly, followers of Wicca see themselves as descendents of older European practices -- some followers of both see their origins in the Druid communities. In Japan, the shinko shukyo, or newer religions, exist in addition to several ancient traditions that continue to be practiced. Post-colonial Africa has seen a resurgence beginning in the recovery of non-Western religious practices alongside continuing growth in both Christian and Islamic communities. The Bahai faith is an example of a new religion growing out of Islamic (and thus the Judeo-Christian-Islamic) tradition; twentieth century groups such as Scientologists and the Unification Church continue to generate controversy, both in terms of belief and practice. The book includes a chronology presented both in column text and in two-page graphic format as a timeline. There is also a great index, and a useful bibliography. The text is written assuming no particular background in religion, theology or history, but rather a basic beginning college reading level. Advanced students from secondary schools may also find this useful, and the illustrated format makes it an interesting book for almost any reader.